Noroviruses cause an unpleasant, but rarely serious, diarrhea and vomiting-type disease — “cruise ship flu”1 is one term for it. As well as cruise ships, nursing homes and hospitals and other more or less closed systems also see outbreaks of norovirus disease fairly regularly, and as you’d expect the elderly and immune-compromised are more at risk from the disease. 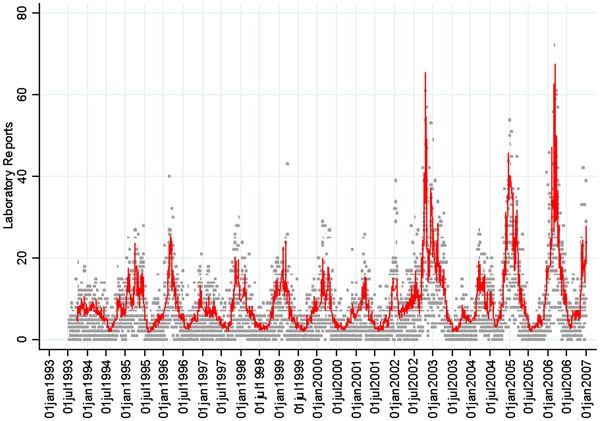 Noroviruses have been around for a long time (they were first identified in the early 1970s, as “Norwalk Viruses”), but it’s in the last ten years or less that they really exploded; in 2002 there was an abrupt, worldwide upsurge of norovirus outbreaks, and more epidemics have followed almost every winter. Those outbreaks were all different mutant variants of norovirus; I talked about this earlier.2 Each outbreak3 was associated with a new variant of norovirus, that is no longer controlled by the immunity that controlled the previous outbreak. 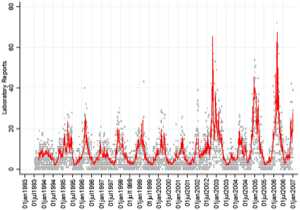 A couple of recent papers look at norovirus epidemics more closely. One4 analyzed the different strains involved in global outbreaks. 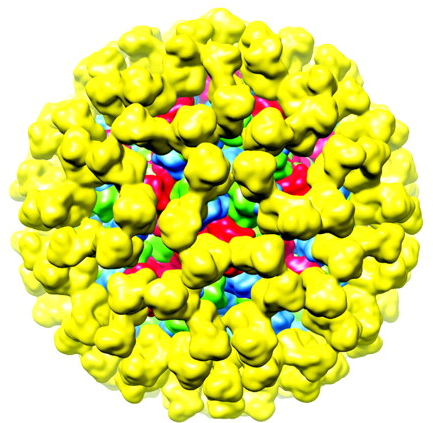 They found that there were eight distinct variants of the GII.4 noroviruses, three of which caused global epidemics. Other strains did become epidemic, but on a more local scale (countries or continents, rather than everywhere). My first thought was that that’s essentially the strategy that influenza viruses have used, also very effectively; each new flu season sees new variants of influenza virus, and each season’s most abundant viruses are the ones that are less well controlled by the immunity among their target population. This is the notorious “antigenic shift” that beginning virologists learn to parrot in their first class. The parallel to influenza epidemics was also noted by the authors, and they pointed out another parallel: Most of the global norovirus epidemics seem to have originated in Asia, as with influenza A. The “new variant” part matches the first paper’s description of epidemics — mostly, but not always, they’re driven by a new version of the virus, but new variants don’t necessarily explode globally. It seems that a new variant may often be necessary for an outbreak, but isn’t sufficient; and in some cases, other factors may mean new variants aren’t absolutely necessary. Cool, dry weather supports an epidemic (and this is probably a big part of the highly seasonal pattern of norovirus infections, as well; it’s charmingly called “Winter vomiting disease” by some). And epidemics are possible when population immunity to a particular strain of norovirus drops under a certain level. The authors point out that new variants are selected by population immunity, so two of these factors are not strictly independent. However, “ Despite this, these two factors had significant effects after controlling for the other ”;5 perhaps there’s some immunity even to variant strains of norovirus. Since immunity to norovirus does drop very quickly,7 perhaps a year is enough to open a window for new strains, but not for the same one; particularly if the weather cooperates. Or perhaps the arrow is going the other way — population immunity at the end of one season chokes out the prevalent strain, and only new strains that are relatively resistant survive to cause the next epidemic once the weather cooperates. At any rate, from these parameters the authors derived a predictive model. Applied retrospectively, it looks pretty impressive (see the figure to the right; click for a larger version). 8 It will be interesting to see how well it actually predicts new outbreaks. By the way, regular readers may have noticed that this is two weeks in a row with only one new post — I usually aim for two or three per week, but what with my kids starting their school this week, and my teaching schedule9 kicking in, I’m scrambling some to keep up. Hopefully I’ll be in more control soon, but I make no promises. What about cool dry weather assists norovirus outbreaks? If I had to throw out a grabbag of possibilities to investigate, I’d nominate 1) cold weather keeps people indoors where fomite contact and recirculated air (aerosol contact with vomitus or toilet flush aerosol) contact are increased, but then what does “dry” have to do with anything; 2) maybe humidity helps break down the protein coat so that they last longer in dry environments; 3) maybe cool and dry is a proxy factor for behavior that tends to spread the virus such as staying indoors or less handwashing. Cool dry hands feel clean, with warm hands in humid weather your hands feel oilier. I would not however think that the weather had anything to do with immunity suppression. From what I’ve heard, the ancient superstition that drafts or chill air cause disease in virtue of their temperature is just that, and that many studies have shown that any winter increase in the common cold is not from suppressed immunity but more people in closer contact indoors in the winter; subjecting people to drafts, cold water, etc. does not increase the number of colds, influenza etc. (“influenza” I hear derives from “influence”, meaning “inflow”, i.e., the old idea that disease comes in on a draft). Anyway is there any good research on why norovirus is a “winter” vomiting disease and specifically why “cool, dry” conditions correlate with outbreaks, as opposed to simply “cool”?